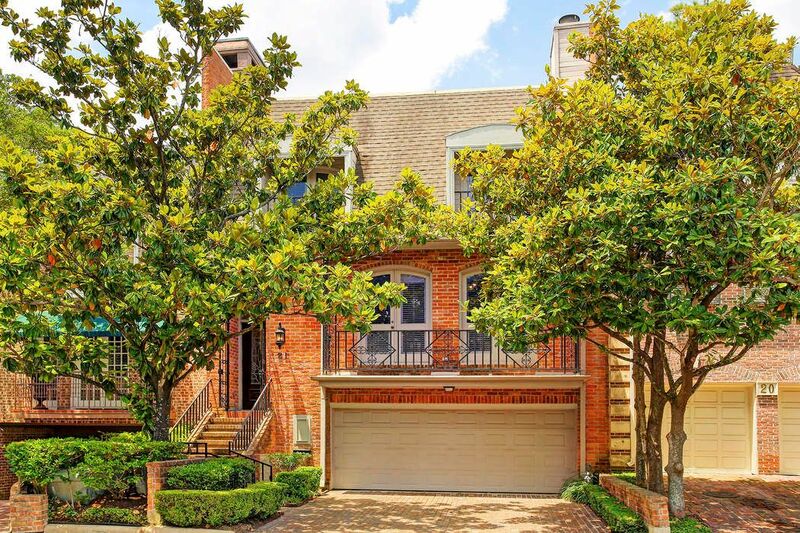 21 Pine Briar Circle, Houston, TX 77056 | Martha Turner Sotheby's International Realty, Inc. 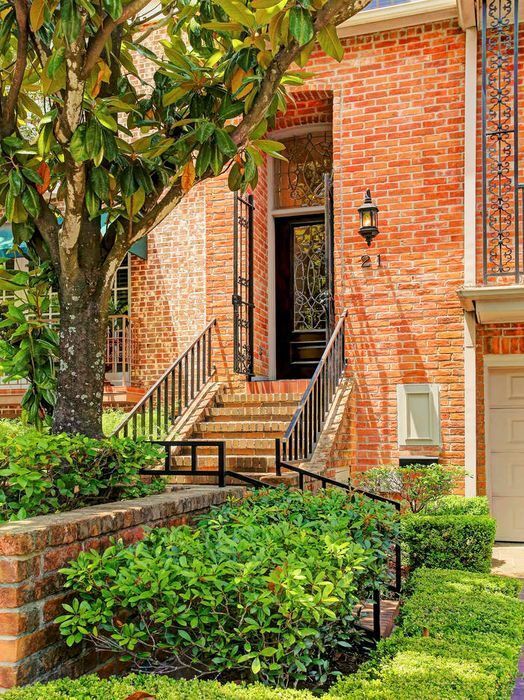 Traditional style townhome in exclusive Pine Briar enclave in Tanglewood area. Lucian Hood designed home, built by Barnett Builders. Charming curb appeal. Oversized 2 car garage w/ double wide driveway. Gated access & community guest parking. 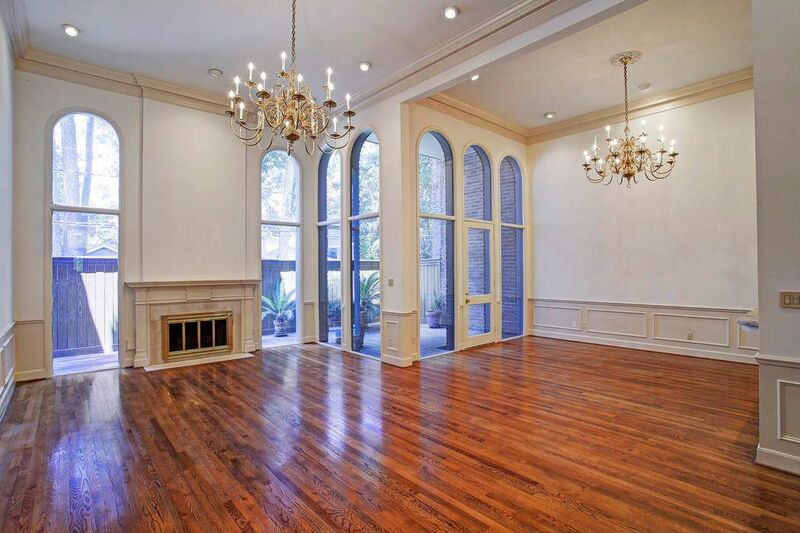 Stunning LIVING ROOM (29x29) with soaring 16 foot high ceilings. Wall of floor to ceiling arched windows gives you views of tranquil matures trees, creates lots of natural light. Two large brass chandeliers. Cozy gas log fireplace. Another view of the living room /bar area looking up towards the formal dining. Fabulous for entertaining. Unique space allows you to create multiple sitting areas. 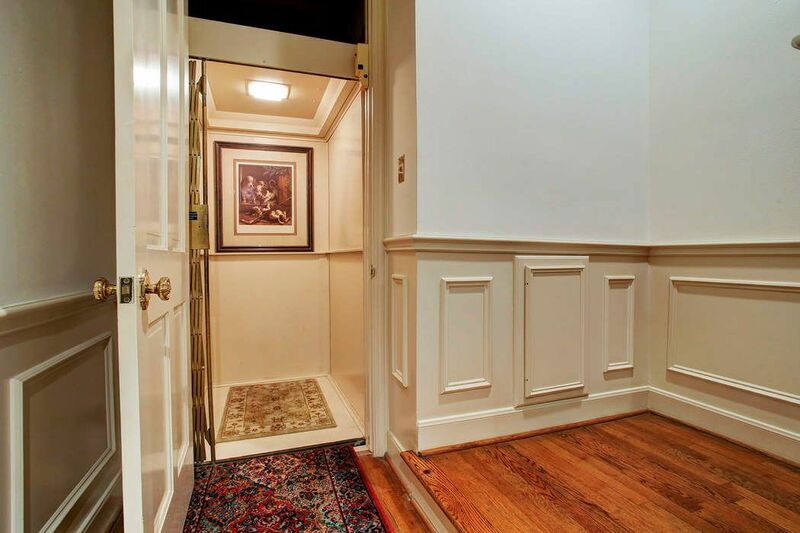 Notice the wainscoting with chair rail and beautiful wood floor throughout. Banquet size DINING ROOM (20X13), opens down towards living room; creating a great entertaining space! 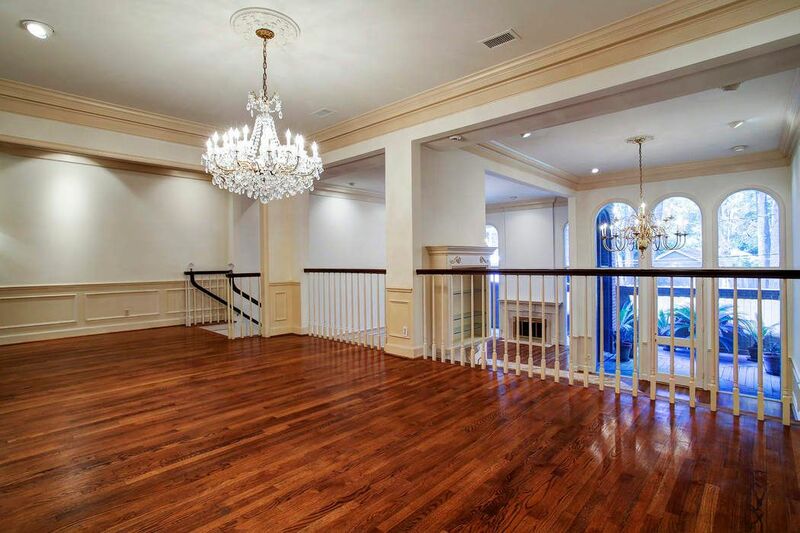 Stunning crystal chandelier, wainscoting with chair rail, wood floor, double crown molding, recessed lighting. Another view of the kitchen with Sub Zero refrigerator with freezer drawer, KitchenAid double electric/convection oven, trash compactor and dishwasher, GE Profile microwave, Dacor 5 burner electric stovetop w/ decorative wood exhaust vent above. Cozy MORNING ROOM (17x12). 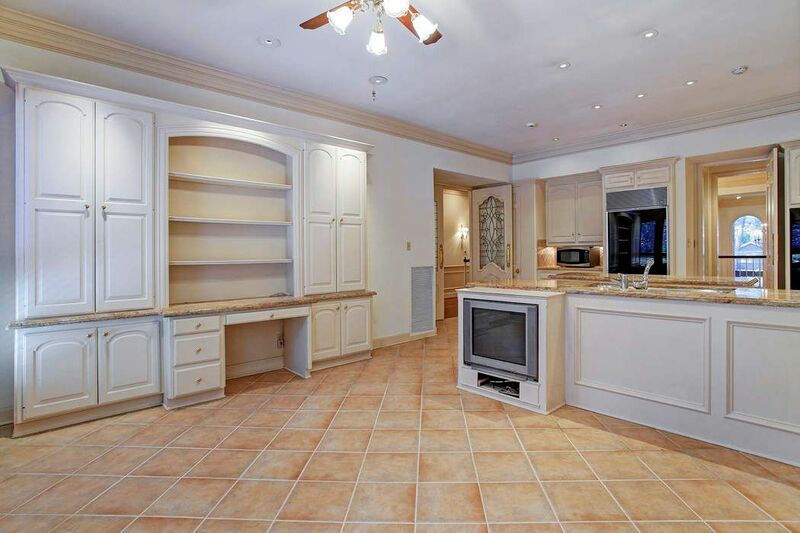 Open floor plan w/ kitchen, ideal breakfast room/sitting area. Gas fireplace w/ custom built mantle w/ granite surround accent. Built-in display shelves w/ cabinets on both sides of fireplace. 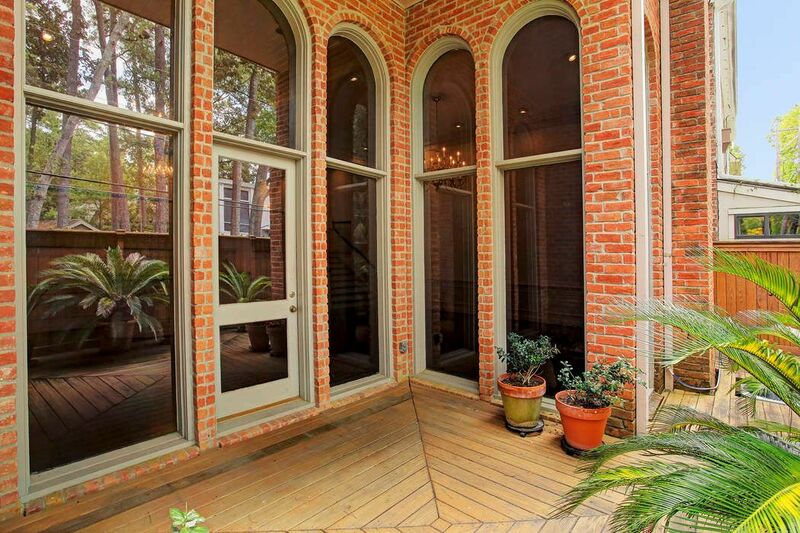 French doors lead to balcony. Another view of the morning room/breakfast room space with built-in desk/home office with granite countertop, display shelves and tons of cabinets. Built-in television cabinet. 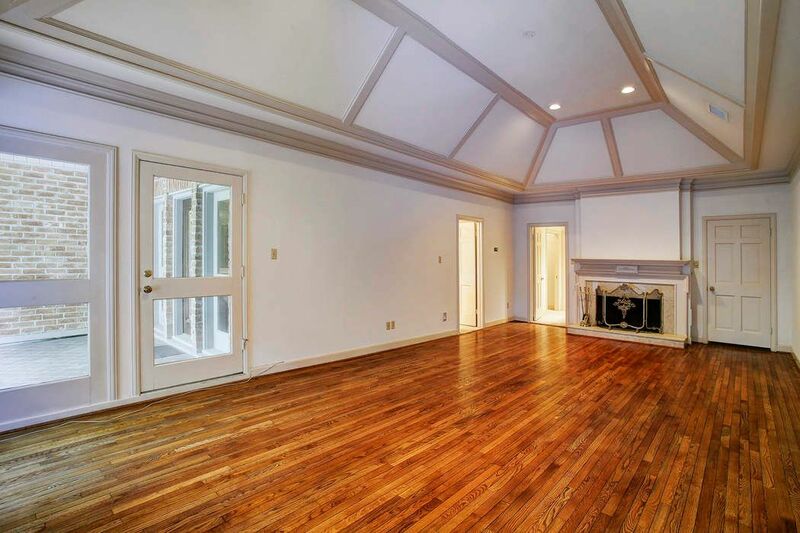 Crown molding, recessed lighting, ceiling fan w/ light, tile floor. 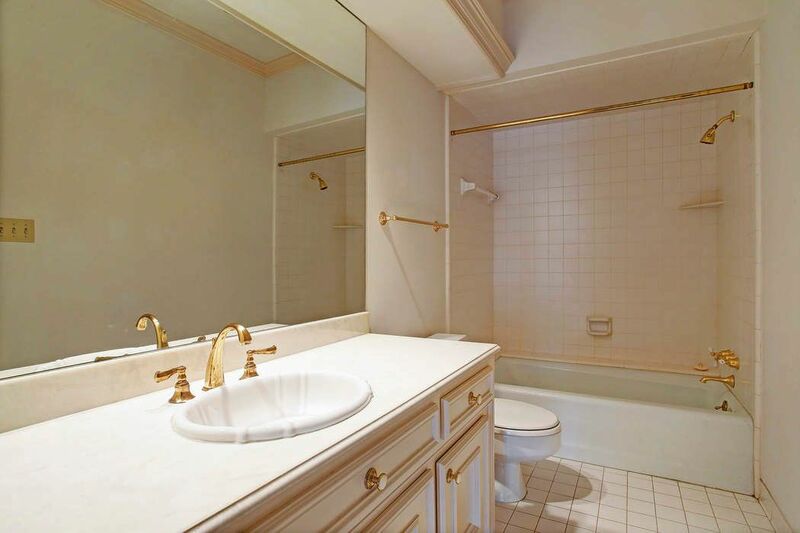 POWDER ROOM with two decorative sconces, wallpaper, cultured marble countertop, gold and crystal fixtures, separate water closet, crown molding, tile floor. Entry/gallery area. 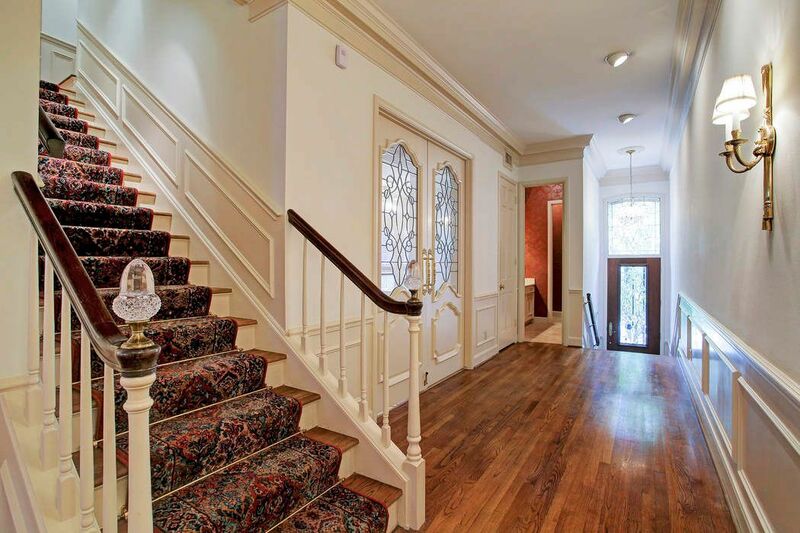 Notice the custom carpet on stairways with brass stair rods throughout home. 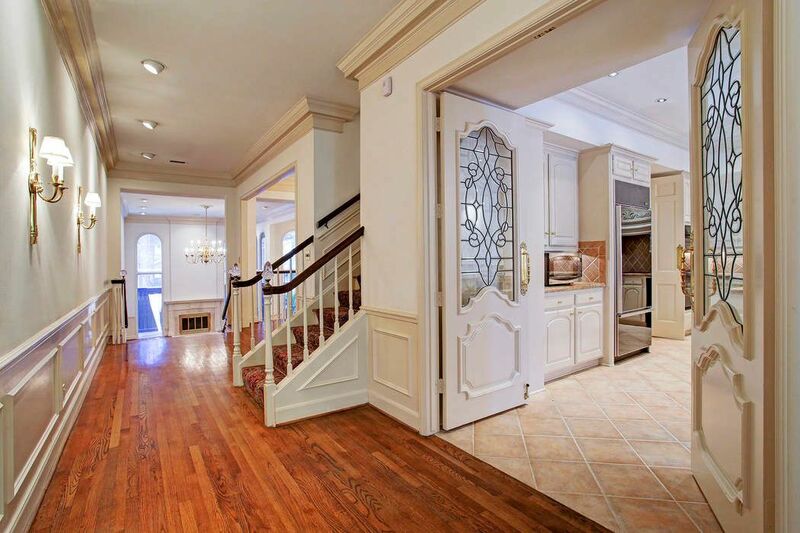 To the right is the front door with crystal chandelier, powder room and coat closet. Double custom leaded glass doors lead to the kitchen. Custom designed WINE ROOM located on the first floor. 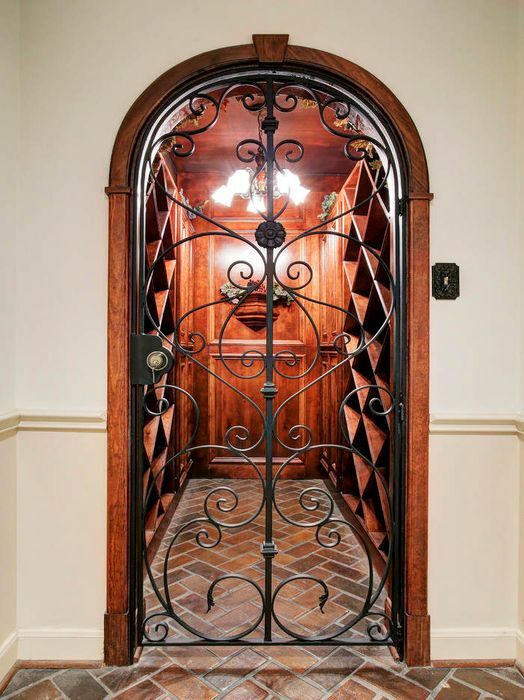 Gorgeous custom arched wrought iron door, beautiful herringbone pattern brick floor, decorative light fixture, tons of built-in wine storage racks and storage cabinets. MASTER BEDROOM (27x1S) is a luxurious retreat. 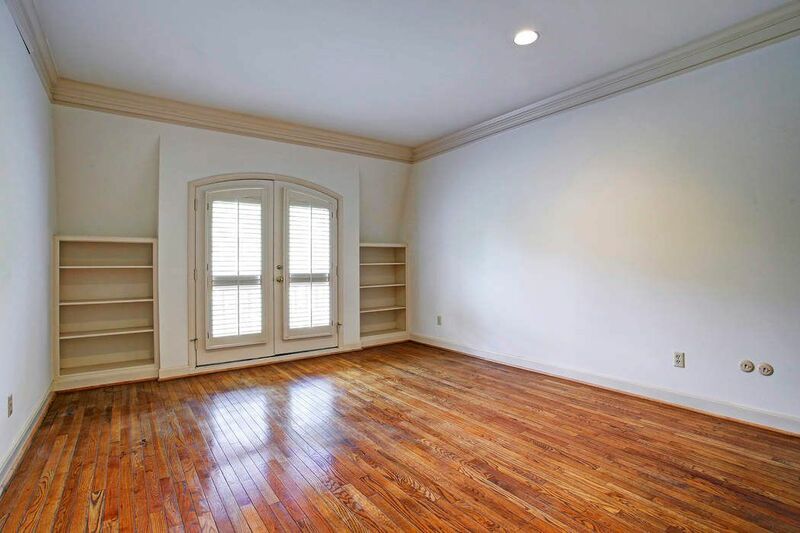 Enormous room w/ plenty of space for a sitting area. 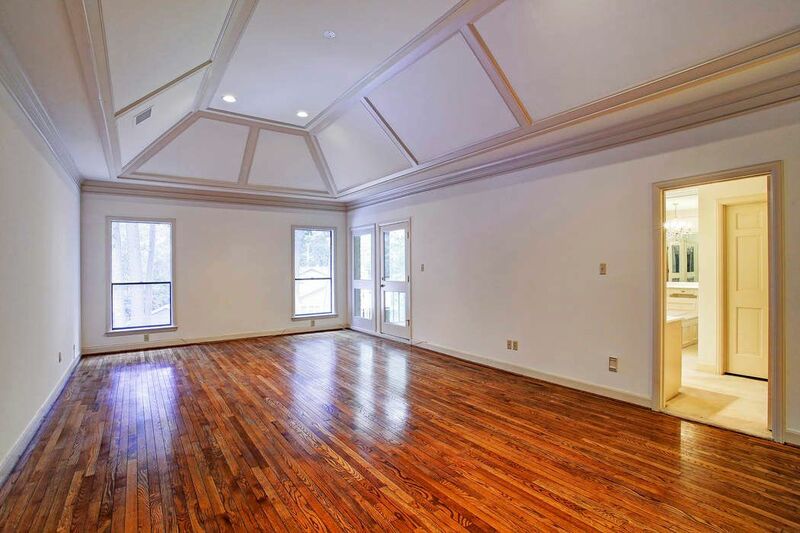 Gorgeous coffered ceiling, creating a 12 foot high ceiling. 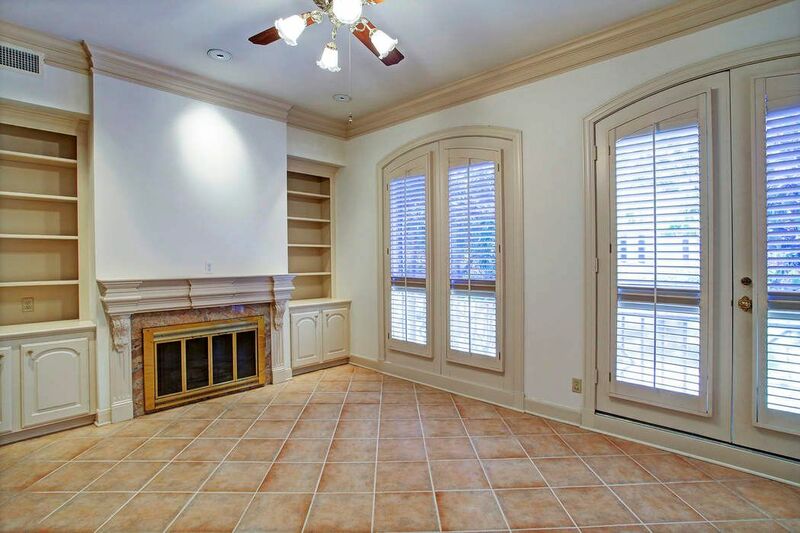 Perfect space to get away & relax in front of your gas fireplace with marble surround. Another view of the master bedroom. Glass door leads to private balcony. 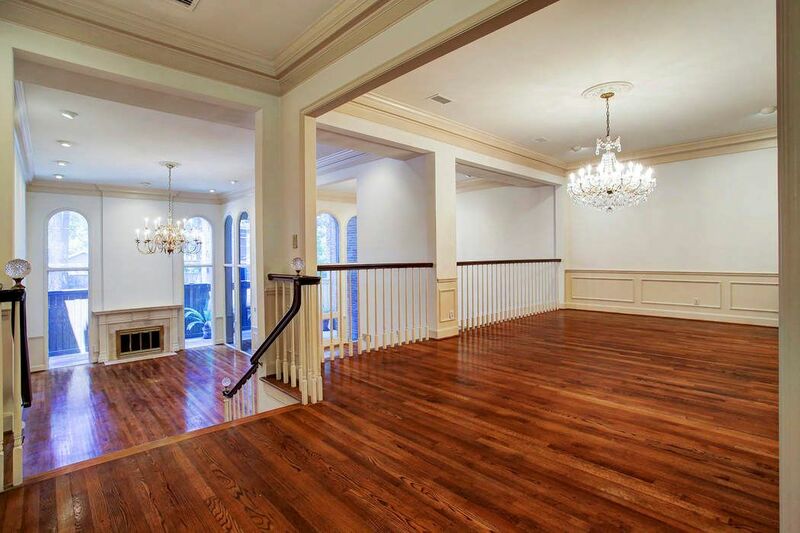 Gorgeous hardwood floor. Electrical outlet for a light fixture in center of room, neutral painted walls, recessed lighting, double crown molding. Secondary BEDROOM #1, located on the third level, with built-in bookcases with adjustable shelves, glass door leads to Juliet balcony, shutters, wall closet, wood floor, crown molding, recessed lighting. 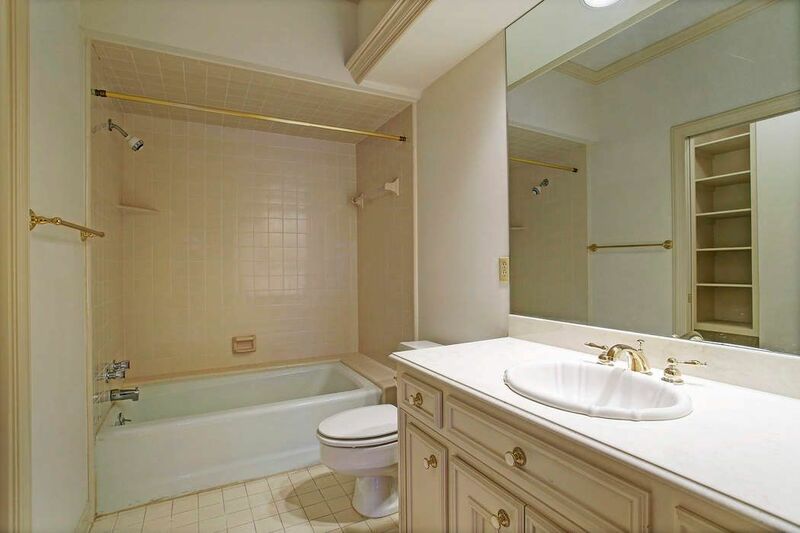 EN-SUITE BATH for secondary bedroom #1 with crown molding, recessed lighting, cultured marble countertop, porcelain sink, built-in medicine cabinet, tub/shower combination, tile floor. 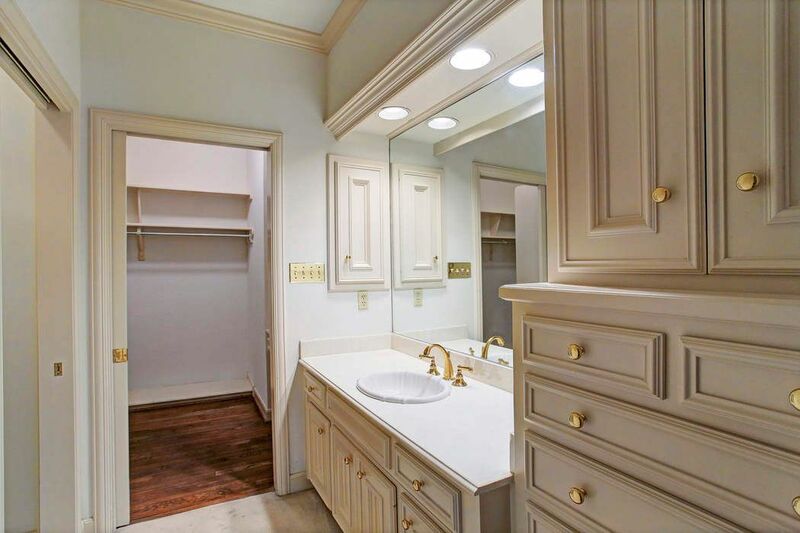 EN-SUITE BATH for secondary bedroom #2 with large walk-in closet with pocket door, crown molding, recessed lighting, cultured marble countertop, porcelain sink, built-in medicine cabinet, tub/shower combination, tile floor. 4th BEDROOM could make an ideal STUDY or GAMEROOM (28x13). Located on the first level. 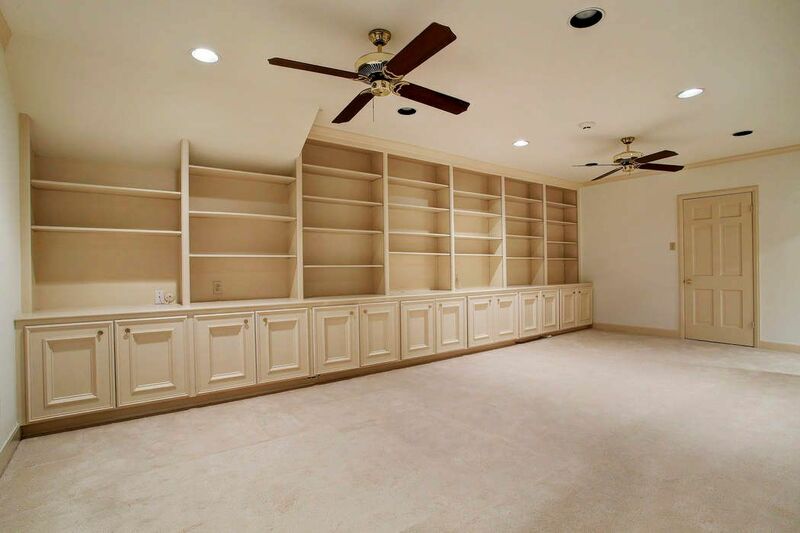 Two ceiling fans, wall to wall built-in w/ adjustable shelves, cabinets, slide-out drawers, neutral carpet, recessed lighting, walk-in closet w/ shower. Make your life easy with the ELEVATOR that services all three levels. Unload your groceries from the garage to the elevator and take them up directly to the kitchen. Phone installed. 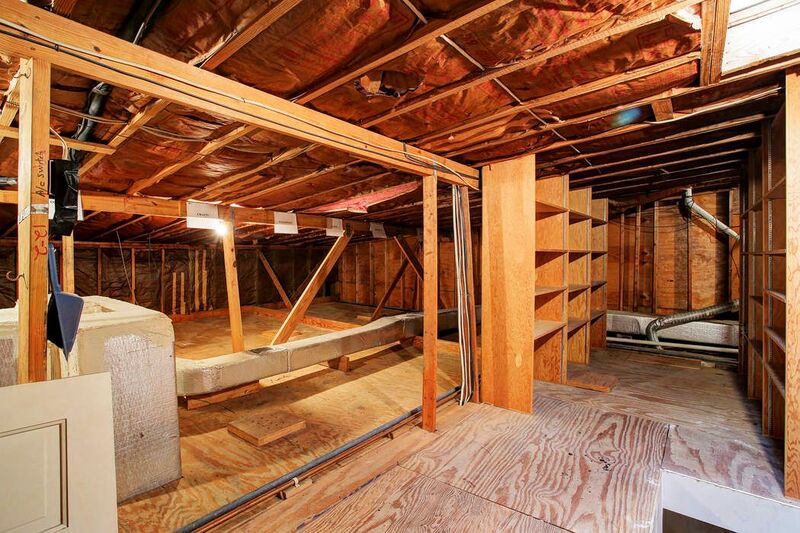 Amazing 4th floor floored attic space for TONS of storage. Notice the built-in shelving. Convenient storage for all of your holiday decorations! Fully fenced outdoor PATIO with plenty of space for a table, chairs, and grill to entertain. Courtyard/patio space has a hose bib, recessed lighting, and electrical outlets. 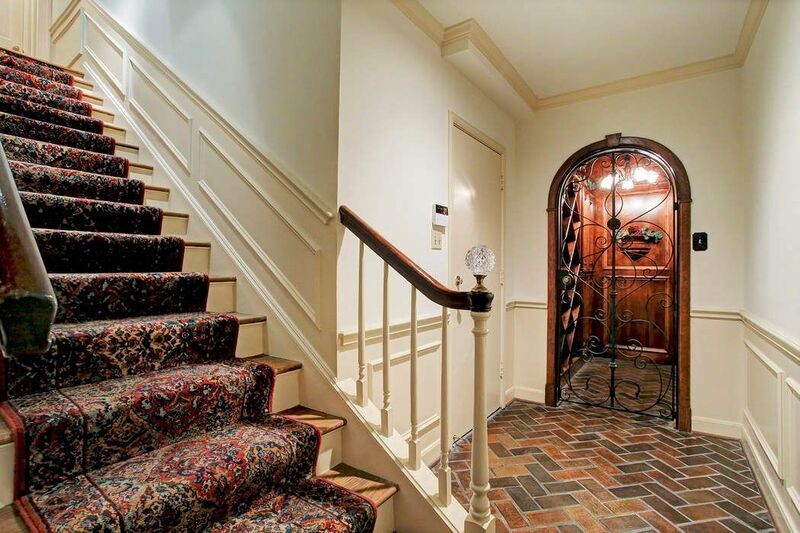 Brick steps leads to beautiful leaded glass front door. ENTRY with 2 decorative sconces. 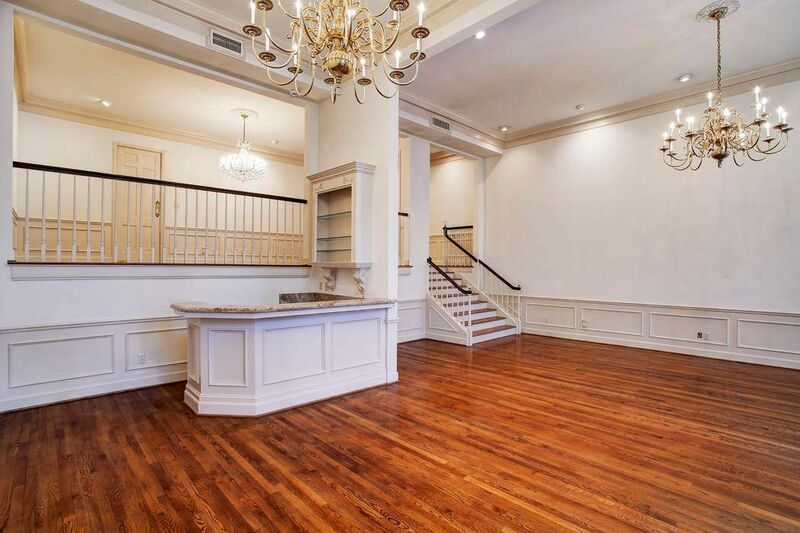 Wainscoting with chair rail down the entire length of the gallery, double crown molding and recessed lighting, wood floor all enhance the charm. View of stairs leading down to the first floor. Door to the left leads to the garage. Herringbone brick floor. Another view of the wine room with custom door. One more view of the living room and bar, looking towards the dining area. Another view of the formal dining room. 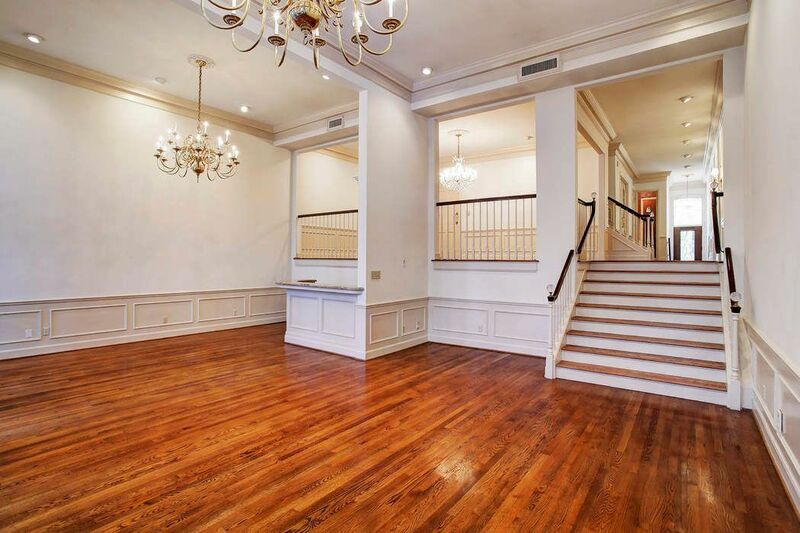 Amazing two story entertaining space, with the open floor plan with dining and living room. 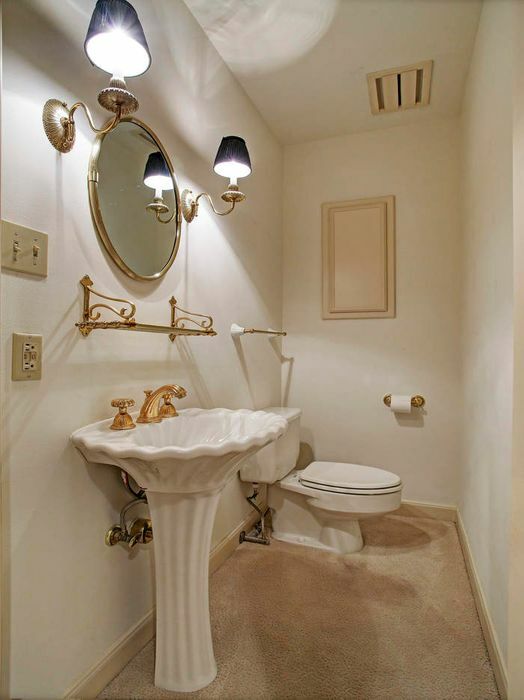 Bath located on the first level with 2 decorative light fixtures, pedestal sink, built-in medicine cabinet. 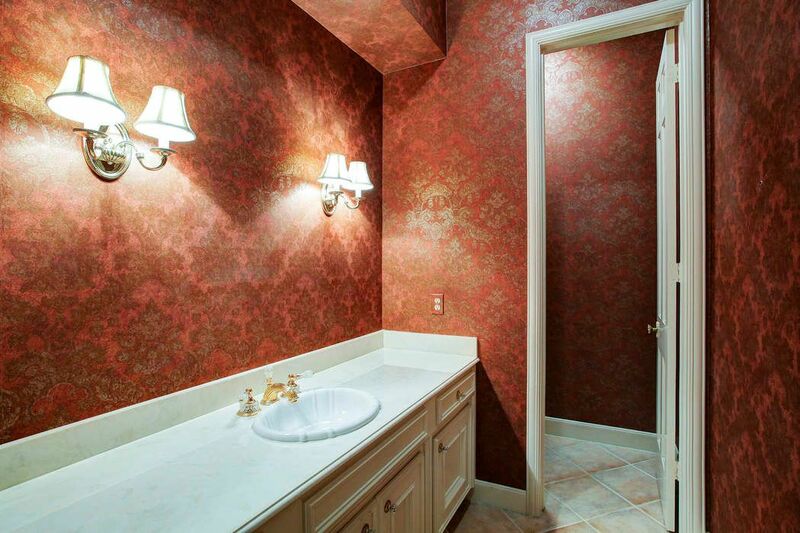 Note: the shower for this bath is in the walk-in closet. 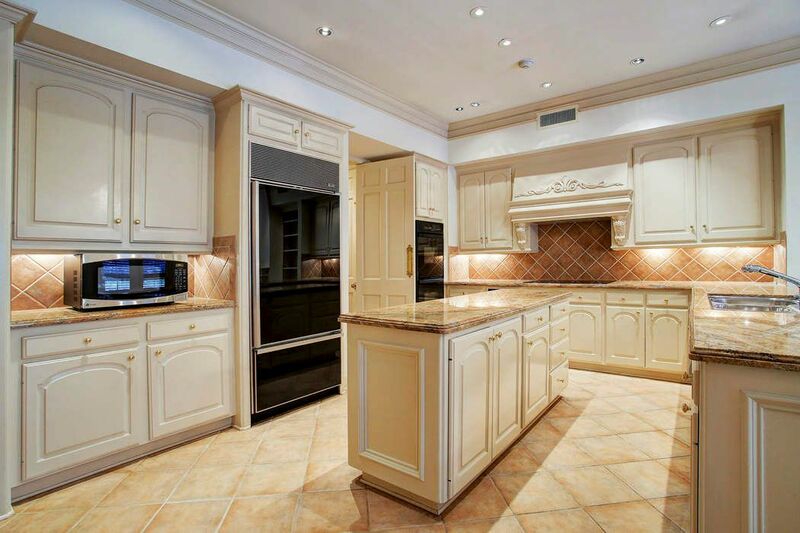 $899,000 3 Bedrooms5 Full / 1 Partial Baths4,557 sq. ft.